Larger groups may be easier to pitch than smaller ones. Communications guru Dianna Booher claims it’s easier to convince a group of thirty people than to win over a smaller audience of three. The bigger the crowd, Booher explains, the more anonymous each person feels, allowing people to drop their guard and think more independently. In small groups, people tend to stuff their emotions, and in a larger group they relax and are more likely to be themselves. Five highlights from Machu Picchu. My friend Andrew and I arrived back in Asheville Saturday after an amazing eight-day Peruvian pilgrimage. 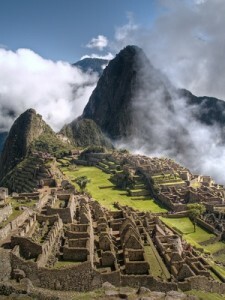 We visited Cusco, the Sacred Valley, and Lima, but by far the highlight of our trip was the day spent in Machu Picchu. Those of you who know me know I love lists. So here are my top five highlights of our day in the sacred city. One: You can’t take a bad photo in Machu Picchu. Every angle, every frame captures something magnificent. “Awestruck” is the only word that comes close to describing how we felt during our time there. 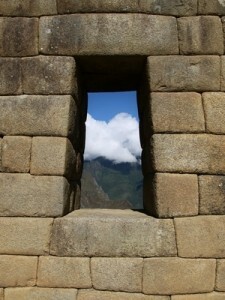 Two: Some say the stones of Machu Picchu radiate energy. Our guide rolled her eyes saying the stones only reflect heat from the sun. Either way, I felt something (and I choose to believe it was energy). Three: Andrew was like a billy goat climbing up and down the steep stone stairs of Machu Picchu to photograph llamas. You can take the boy off the farm but you’ll never take the farm far away from him. I bet Andrew got at least a hundred photos of the shaggy creatures during our trip, and not one llama spit at him. Four: Riiiing! It’s hard to believe, but I heard two cell phones go off in Machu Picchu. Worse, the people took the calls. Five: During lunch we found ourselves mesmerized by two Asian men eating from the buffet at the elegant Sanctuary Hotel outside the grounds of the ruins. One shoveled his food while the other slowly savored each bite, reminding us to savor each delicious moment of life. I am still processing all that I saw, learned, and experienced. It was an incredible trip, filled with beauty, inspiration, insight, and awe. A few weeks ago, I went to a lecture at the Rubin Museum in New York on how to die. The lecture was a part of the museum’s Tibetan Book of Dead Book Club series. During it, the speaker suggested that the way we die is the way we live. His comment got me thinking: I want to see life as an adventure, and I hope to approach death with the same curiosity. Instead of fearing death, I want to embrace it. According to Buddhism, death and life are but two sides of the same coin. Death is a natural part of life, rather than something separate. The speaker continued: “Attachment to life spoils life itself.” Perhaps by beginning to die today, we begin truly living. Traveling with intention. Have you ever stumbled upon a book that made your world a little larger? Years ago, I found a wonderful book by prolific author Joseph Dispenza, The Way of the Traveler: Making Every Trip a Journey of Self-Discovery. Little did I know then that Joseph would become a valued mentor and dear friend. 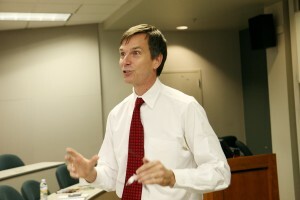 In his book, Joseph says travel is an excellent means for spiritual growth and self-discovery when fueled by intention. He writes: “Travel in the outer world is a metaphor for the epic journey inward. And the reward for this sacred sojourn is the spiritual gift of grace: the grace of peace, the grace of self-knowledge, the grace of wisdom. To guide readers along this path, Joseph offers a series of insightful exercises. One of my favorites is to pack those values you would like to take along with you on your trip. In preparation for the trip, I am following Joseph’s advice. I wrote five values in my travel journal that I wanted to accompany me on the trip. They are: openness, insight, inspiration, gratitude, and connection. I am not sure what to expect, but this I know: I will returned a changed man.